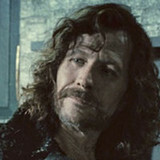 Sirius Black is really cool! along with this Spot! I love Sirius.I wish I'd a Godfather like him.So caring and kind. Sirius is my favorite character ! He's so freakin amazing !